How would you describe the band to anyone new to Kaiser Chiefs? We’re in the line of the great British bands. So you returned from your two year hiatus this year, how has 2011 treated you? 2011 was good. We all had a great time working out how we were gonna release the album and loved the fact that it came off. The night before the album was released was genuinely exciting and it felt the same as when we released the first record, which was sort of the point; to do something new, to make things exciting again. After that we’ve played some great gigs all over the world. Glastonbury was a highlight as was Splendour in Australia; our massive homecoming shows in Leeds and more recently we did our most extensive tour of Europe ever, so all in all, another year of good times. Why did you take the break? What were you doing during that time? We toured or were writing/recording all the time from 2004 to 2009. When you do that, I think you start taking things for granted and it was great to be at home for a while, sit back, take it all in and work out what to do next. As everyone knows now we’re hardly idle to the time off. After Off With Their Heads we toured for another year then had some time off and pretty soon got into writing and recording the 25 tracks that got released in various ways around The Future Is Medieval album. That was a lot of fun. We were able to get together and make music and then go off and do other things before coming back to it again. There was no real deadline. Just when it was finished and the website was designed we could hit the button and stick it out for everyone to enjoy. We loved that. We also liked that it was our little secret. As things progressed the number of people who needed to know got bigger and bigger but we were massively impressed that the whole thing didn’t leak before the day. Has your sound and your influences changed over the years? 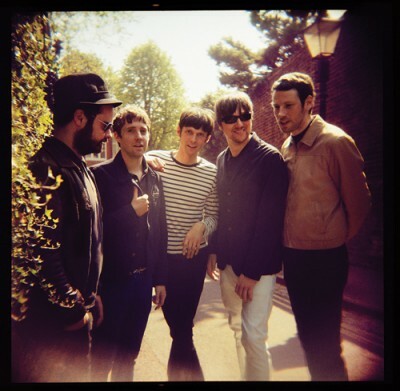 We think that it’s important for bands to develop over time and, particularly on the last album, we tried to stretch the boundaries of what people expect from the Kaiser Chiefs. Loads of people have mentioned to me that they couldn’t believe that certain songs on the last album were by us and that was with intention. We wanted to try different things and experiment with different approaches and different sounds. We think if it’s the five of us playing and singing then it sounds like KC and the challenge was to try to do these different and interesting things while keeping the big tunes that we have been famous for. We keep doing that and we’re looking forward to the year ahead and more new music coming out for everyone to hear. We understand your band name comes from the South African football team, what is the bands link to South Africa? The name does come from South Africa but the link comes from Leeds – our home town. A Leeds United legend, Lucas Radebe signed for Leeds from Kaiser Chiefs and we loved the name so we nicked it! With your most recent album, ‘The Future is Medieval’, we understand that rather than simply allowing download, you let the fans pick 10 out of the 20 songs to make their own album for £7.50. What made you decide to take this approach? It came from an idea Ricky had, but the main motivation was seeing record sales in general go down and down. And people more and more think music is something disposable. I think that a lot of people are guilty for letting that happen and we just wanted to do something different to everyone else, to stand out from the crowd, to make people stop for a minute and listen to the record rather than just downloading it and moving onto the next thing. Obviously something has to happen with how music is sold and we were just trying to actually do something rather than just sit around and moan about how things used to be. How do you think online has influenced the production of full albums? More than ever tracks are important and iTunes has made it easy to grab music you want quickly. I think that is a great thing in a way but though people think we are a singles band actually albums have always been massively important to us. We always tried to make our albums flow and be interesting all the way through. The way we did The Future Is Medieval made that less important and that again was intentional. If people want to pick and choose tracks we thought it would be cool to give them more choice; let them get on with picking tracks. But in a sly way, because they had to pick 10 to complete the album, we got a lot of people thinking about the album and the running order, in order to pick the ultimate track list. We are also about to release the vinyl version ourselves – basically ‘cause it’s not really financially viable for record companies to do that anymore. So basically, I think while bands and artists are still interested in making albums, they still have a long way to go. How instrumental were your awards with NME and the Brits to your success as a band? At first with awards we took them for granted and just thought it was a good night out but I think they were actually really important – especially the first few, and especially to separate us from the crowd when we went places outside the UK. Please click here to read the full interview online.